Downtide fishing is the conventional method of boat fishing, used by anglers since boat fishing became popular. It has seen described as the most basic form of boat angling, but in fact it is far from basic if you approach it in a thinking manner. First principles [n theory it is simplicity itself. Anchor over a decent mark, drop your baited tackle over the side, wait for a fish to signal its presence and winch it up. What could be easier? In practice, however, the location, state of the ide, target species, bait and many other variables all affect your choice of tackle and the way you use it. Though you can catch conger in other ways, by far the most successful is downtiding with a live or dead fish or cuttlefish. On open ground rays such as this big blonde are a prime target. Use as long a flowing trace as you can manage in the tide and fish downtide.Fishing downtide you have to be careful to avoid tangles. Near the bow this means a heavy lead or a long rod to keep your line away from those of other anglers. 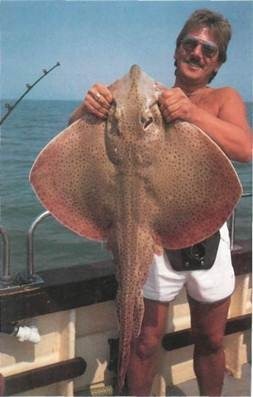 Downtiding isn’t all about heavy rods and hawser as line – inshore you can often fish light for species such as bass and plaice.An angler battles with a monster on 50lb (22.7kg) downtiding gear in St. Catherine’s Deeps off the Isle of Wight. The strong tide run and deep water there means you need heavy tackle and weights. With the boat at anchor, the full force of the tide acts on the tackle and line, carrying it downtide when you drop it in. The distance the bait ends up downtide of the boat depends on the strength of the tide, the diameter of the line, the weight you are using and the depth of the water. What usually happens is that all the baits end up in a fairly narrow band off the back of the boat. It is the combined scent trail from all of them that attracts fish from downtide and they follow it up the tide until they find the baits. When there are plenty of fish about and they are hungry, even the most basic tactics can produce a few bites. But when you have to work for your fish, a knowledge of how your tackle is behaving in the water is essential. With just a few fish about, or with fish that are finicky, you must take care over bait quality, presentation and even where you put it on the sea bed. Bait quality is vital. A fussy fish is only interested in the freshest and juiciest of baits. Only use top quality bait and replace it regularly. How often you replace it depends partly on the tide – bait washes out quicker in a fast flow. Every ten minutes is a good rule to start with, even if it looks to be in perfect condition. Getting your bait in the right place is also important because most fish caught swim up the tide, attracted by the scent trail of all the baits. As they approach the boat, the scent trail from the bait nearest them is strongest and is naturally the one they follow up. Therefore it makes sense to position your bait fairly well down the overall scent trail. 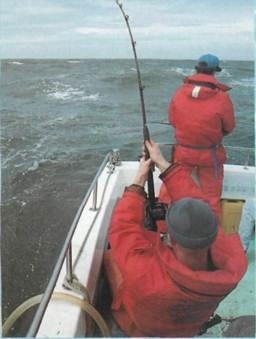 However, this is only practical for anglers at the back of the boat. Tangles inevitably follow if anglers compete to trot their baits farther and farther back past each other. For anglers farther up the boat the irony is twofold. Not only do the fish find the downtide anglers’ baits first, the downtide angler is also making use of the scent trail from the baits of anglers farther up the boat! This is why the back of the boat is usually the most popular place. If you do happen to be fishing at the stern you can work your tackle downtide, searching out the sea bed until you find an area line off the reel. The tide acts on the line to lift the tackle and drag it downtide. Repeating this process allows you to walk the bait back to the fish – with any luck. Problems arise when anglers fishing the bow positions try to even the odds and fish in the same way. Tangles are impossible to which holds a few fish. It could be a gulley, a depression, a patch of rocks or weed, or just one of the pathways across the bottom that fish move along for no obvious reason. A rule often quoted for avoiding this is hat the anglers at the stern should use ighter leads, while those closer to the bow should use heavy ones. This does help to avoid tangles because the lighter leads from ;he back of the boat end up much farther downtide than the heavier leads – but it usually limits the catches of those near the bow. It’s fine when there are loads of ravenous fish about, but when the fishing is lard, it’s hardly fair. So how do you even the odds when you’re ishing near the bow? Short of rotating positions in the boat every five minutes, you have two options. 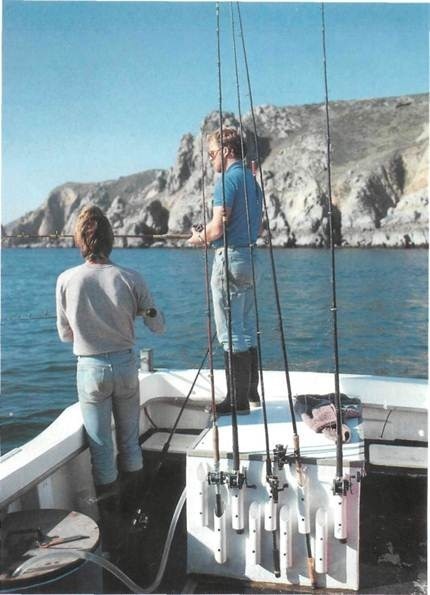 Use a longer rod (at least 10ft/3m), perhaps a long boatcaster or beachcaster, to drop your rig in as far from he side of the boat as you can, reducing the chance of tangles as you trot the lead back. Or, the other option when in shallow water, is to cast and fish uptide, which allows you to take full advantage of the scent trail from your own bait. Bait presentation is more important than you might think and there are many factors that affect it. The most obvious is your choice of end rig. These can be split into two basic types – flowing traces and up-the-line paternosters. Trace length can be crucial, with circumstances often dictating how long a trace can be. Over wrecks and reefs a short trace of 50cm-1.5m (2-5 ft) is usually the order of the day. A longer one tends to snag in rocks or wreckage, and allows fish, especially conger eels, time to reach sanctuary. On open ground a long trace is often a distinct advantage. As a general rule, start with as long as trace as you can comfortably manage, usually 1.2-2.4m (4-8ft). 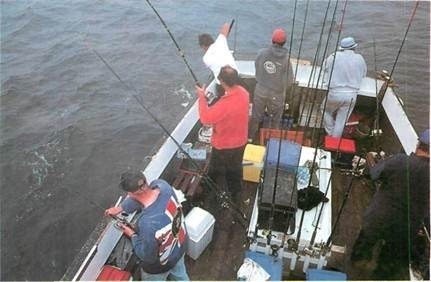 You should then change the length until you are catching as many or more fish as the other anglers on the boat. The amount of lead you use to get the bait down is also important. The more lead you use, the more directly vertical you will be fishing. To start with, an angle of 30-60° to the vertical is ideal. For some reason, changing the amount of lead, and therefore the angle of your line down to the bait, can sometimes dramatically change the number of bites you get. It has something to do with the way the bait is presented, though no-one has ever been able to explain exactly how it works. In any case, if bites are not forthcoming, it’s always worth trying a weight an ounce or two (28-57g) heavier or lighter to see if it makes a difference. This technique can be especially valuable when you don’t have to worry about other anglers picking off the fish farther downtide! Reacting to bites is another area where many anglers come unstuck. Remember that a fish is a creature of very limited intellect trying to eat the bait. It is not a super-intelligent being trying to remove the bait from the hook without getting caught! Far more fish are lost through impatience than are ever lost by leaving them for a little longer. It’s usually better not to hold the rod; just watch the rod tip instead. Holding the rod often leads to a premature reaction to a bite, especially on days when bites are few and far between. If you get a timid bite, in many cases the best thing you can do is to let a couple of metres (6-7ft) of line off the reel. This often induces a more positive response from the fish. Even when you’re sure the fish has taken the bait, you shouldn’t strike. Striking loses more fish than it catches. Instead, pick up the rod, and wind in the slack while lowering the rod to the water. Raise the rod tip to lift the lead off the bottom, and keep lifting until you feel the weight of the fish. Even if the fish hasn’t taken the bait, this slow lift often tempts it to do so. When you do feel the weight of the fish, lean into it to set the hook. Follow these few simple rules and you’ll find fishing downtide a lot more fruitful. But a lot of it is practice and feel, so keep at it – and watch your catches improve.